Background: Epidural analgesia is claimed to result in prolonged labor. Previous studies have assessed epidural analgesia vs systemic opioids rather than to parturients receiving no analgesia. This study aimed to evaluate the effect of epidural analgesia on labor duration compared with parturients devoid of analgesia. Methods: One hundred sixty nulliparous women in spontaneous labor at full term with a singleton vertex presentation were assigned to the study. Parturients who request epidural analgesia were allocated in the epidural group, whereas those not enthusiastic to labor analgesia were allocated in the control group. Epidural analgesia was provided with 20 mL bolus 0.5% epidural lidocaine plus fentanyl and maintained at 10 mL for 1 h. Duration of the first and second stages of labor, number of parturients receiving oxytocin, maximal oxytocin dose required for each parturient, numbers of instrumental vaginal, vacuum-assisted, and cesarean deliveries and neonatal Apgar score were recorded. Results: There was no statistical difference in the duration of the active-first and the second stages of labor, instrumental delivery, vacuum-assisted or cesarean delivery rates, the number of newborns with 1-min and 5-min Apgar scores less than 7 between both groups and number of parturients receiving oxytocin, however, the maximal oxytocin dose was significantly higher in the epidural group. Conclusion: Epidural analgesia by lidocaine (0.5%) and fentanyl does not prolong labor compared with parturients without analgesia; however, significant oxytocin augmentation is required during the epidural analgesia to keep up the aforementioned average labor duration. There is continuing controversy over whether epidural analgesia would prolong labor duration. Evidence is unclear as most of the previous studies (probably due to ethical considerations) have compared epidural analgesia to systemic opioids mainly meperidine rather than to a control group not receiving any sort of analgesia during labor. Nonetheless, even with the several methods of analgesia to manage pain during labor, some parturients may still desire a natural childbirth rather than to use conventional pain relief medications. Those women though may do breathing and mental exercises to lend a hand in dwindling pain during labor, yet they ought to be secure that pain medications could be readily available at any time throughout labor. The aim of this study was to evaluate the effect of dilute lidocaine epidural analgesia on labor duration, and oxytocin augmentation, compared with parturient with no analgesia. This study protocol was developed in association with obstetricians and approved by the local ethics committee. One hundred sixty parturients who presented in spontaneous labor were enrolled in the study after a written informed consent was signed. The inclusion criteria for the study were nulliparity, age 18-35 years, body weight <90 kg, gestational age 37 weeks or more, single fetus in vertex presentation, normal fetal heart rate pattern status, cervical dilatation of 4 cm, American Society of Anesthesiologists (ASA) physical Status I or II, and request for analgesia. Exclusion criteria included ASA status >II, age <18 or >35 years, receiving analgesia less than 4 h prior to enrollment, multiparity, cervical dilatation >4 cm, presence of complicated hypertension, recent hemorrhage, eclampsia, preeclampsia, suspicion of fetal malformation or intrauterine fetal growth retardation, fever of more than 38°C or history of allergy to local anesthetics or meperidine. Parturients who desired epidural analgesia were allocated in the first group (epidural group), whereas those who were not enthusiastic to labor analgesia were allocated in the second group (control). Randomization was done before the start of the study by means of computer-generated randomization (SPSS 16, SPSS Inc, Chicago, IL, USA). For each group, randomly 80 numbers in increasing order (ie, 1, 3, 4, 7, 11, 14,…) were chosen by the computer from a given 200 serial numbers (1-200). The list of generated numbers for each group was held by a midwife not involved in the study. The anesthetist who shared the choice of delivery with the parturient (with or without analgesia) was blind to the next serial number assigned by the computer. The parturient was enrolled in the study only if her order number matched the next serial computer-generated number. Maternal oxygen saturation (SpO 2 ), heart rate, automated noninvasive blood pressure and continuous fetal heart rate were monitored throughout the course of labor. The obstetric management was similar in both groups. Midwives conducted the obstetric management of all parturients during labor under the direct supervision of an obstetrician according to the study protocol. Routine intrapartum management of all women included intravenous fluid management and continuous external electronic fetal heart-rate monitoring. Amniotomy is performed at admission as a part of active labor management if the fetal membranes were intact. The frequency and duration of uterine contractions were assessed with the cardiotocographic monitoring (Toitu MT-516, Tokyo, Japan). Pelvic examination was performed every hour to evaluate the progress of labor. The aim was to produce a rate of cervical dilation of at least 1 cm/h. When the rate of dilation fell below this, coincidental with hypotonic uterine contractions, oxytocin is infused in a protocol starting at the equivalent of 6 mIU/min and increasing by 4 mIU/min every 15 min up to a maximum of 40 mIU/min until there are 7 contractions per 15 min. For accurate administration of oxytocin, we diluted 3 IU of oxytocin to 50 mL with 0·9% sodium chloride. This gives a solution containing 60 mIU/mL which, when infused at a rate of 1 mL/h, gives the patient 1 mIU/min of oxytocin. Oxytocin infusion is given through a separate line using a motor driven syringe pump (JMS Co. LTD, SP-500, Hiroshima, Japan). The decision to proceed to operative delivery was made according to maternal or fetal indications. In the epidural group, patients were preloaded with 500 mL of lactated Ringer's solution and a 17-gauge epidural epidural catheter (SIMS Portex LTD, Hythe, UK) was inserted under aseptic precautions in the lateral position at L3-L4 with the loss of resistance to saline technique. The epidural catheter was then secured and the parturient placed in the supine position with left uterine displacement with the head of the bed elevated 20-30 degrees. At 4 cm cervical dilatation and upon request for labor analgesia 20 mL of lidocaine 0.5% with fentanyl 2 μg/mL was injected as three fractionated boluses (5 mL each) within 4 min to achieve a bilateral block at ≥T10 sensory level. Once the epidural analgesia was established, continuous infusion of 10 mL/h of the analgesic solution was started to maintain labor analgesia. Further boluses of 5 mL of the analgesic solution were given for breaking through pain. Hypotension (systolic blood pressure below 100 mmHg or a 20% reduction from baseline) was treated with additional left uterine displacement, maternal oxygen administration, IV fluid bolus, or IV ephedrine as indicated. The visual analogue pain scale (VAPS) [0-100 mm scale: 0=no pain, 100=worst pain ever] was measured at the peak of contractions before and 5, 10, 20, and 30 min after the administration of the epidural analgesia and then at hourly intervals. Sensory level to cold, a Modified Bromage Score (1=complete block; unable to move feet or knee, 2=almost complete block; able to move feet only, 3=partial block; just able to move the knee, 4=detectable weakness of hip flexion, 5=no detectable weakness of hip flexion while supine with full flexion of knees) were obtained 30 min after epidural injection and again at hourly intervals. In the control group, if any parturient requested analgesia, 25 mg of IM meperidine was given and she was excluded from the study. Our primary outcome included the duration of labor, number of patients receiving oxytocin and its maximal dose, whereas our secondary outcome included mode of delivery, 1-min and 5-min neonatal Apgar scores. The study ended at the time of vaginal delivery (spontaneous, instrumental, or with vacuum extraction), or when the decision was made to perform a cesarean delivery for any reason. Statistical analysis was performed using unpaired t test to compare normally distributed and continuous data, whereas the Fisher's exact test was used to compare data expressed as percentages. P<0.05 was considered significant. Analysis was performed using Statistical software version 7.0 for Windows (Statsoft, Tulsa, OK, USA). One hundred sixty term nulliparous women in spontaneous labor were enrolled in this study (80 patients in each group). Parturients in both groups showed similarity in demographic and obstetric data [Table 1]. No parturient in either groups was initially included and later excluded because of pain or any other reason. Epidural 0.5% lidocaine with fentanyl 2 μg/mL produced effective analgesia during labor. VAPS reached zero level after 30 min and then was maintained at the same level throughout the study as was measured at hourly intervals. The upper level of sensory loss to cold was ≥T10. The epidural infusion was maintained at a rate of 10 mL/h. No patient in the epidural group requested supplementary analgesia. Motor block became noticeable in the epidural group within 30 min of the initiation of epidural analgesia and persisted throughout labor. Patients in the epidural group developed noteworthy motor block (85% of patients had modified Bromage score of 4% and 15% had score of 3). Resolution of the sensory and motor block was complete within 2 h after delivery and discontinuing the epidural infusion. Administration of epidural analgesia with 0.5% lidocaine with fentanyl 2 μg/mL during labor did not significantly prolong the first or second stages of labor (P=0.35, 0.41 respectively). There were no significant differences in percentages of subjects who received oxytocin (P=0.25); however, the maximal rate of oxytocin infusion was significantly higher in the epidural group compared with the control group (P=0.001) [Figure 1]. The rate of vaginal, instrumental, vacuum-assisted, or cesarean deliveries were not statistically different between the two groups [Table 2]. Parturients who received epidural analgesia had a significantly higher incidence of hypotension (11.25%) compared with the control group (0%) (P=0.003). No other significant differences were detected regarding other side effects between the two groups. The number of neonates that presented with Apgar scores below 7 at 1 and 5 min were not statistically different between the groups [Table 3]. Naloxone or neonatal ICU admission was not required in either group. In the current study, we found no significant association between epidural analgesia and the number of patients who required oxytocin augmentation during labor. This can be explained by a careful use of oxytocin infusion to negate the possible effect of epidural analgesia on the course of labor. Our results are supported by the findings of Kotaska et al. who reported that epidural analgesia combined with low-dose oxytocin infusion would increase the rate of cesarean delivery and Impey et al. who suggested that the effects of epidural analgesia on the length of labor may be negated with judicious use of oxytocin. On the contrary, other studies ,,, did not find a difference in oxytocin augmentation, however, these studies compared two modes of analgesia during labor rather than comparing epidural analgesia to a control group not receiving any sort of labor analgesia. In our study, the cesarean delivery as well as vacuum-assisted and instrumental delivery rates were not significantly different between both the groups. The results of our study provide further support to the findings of other studies. , Further support to our results was given by Klein  who reported that epidural analgesia when given before the active phase of labor would double the probability of receiving a cesarean section, while if given in the active phase of labor, it would not increase the rate of cesarean section, which was the case in our study as we initiated the epidural analgesia at 4 cm cervical dilatation. It is doubtful whether local anesthetic epidural analgesia would harm neonates. Our results demonstrated no significant difference in neonatal outcome between the epidural and the control groups. This was indicated by the normal Apgar score, the absence of need for naloxone, or mechanical ventilation for the neonates. This was in agreement with the results of Liu et al.,  who performed meta-analysis of 7 randomized controlled trials comparing low concentration epidural infusions with parenteral opioids. Controversially, other studies ,,, demonstrated abnormal neonatal outcome after local anesthetic epidural analgesia, which could be explained by the use of higher equipotent anesthetic concentrations than our study. Although many studies  have compared two different methods of labor analgesia with regard to maternal, obstetric, and neonatal outcomes, there is only one trial done by Morgan et al.,  that compared epidural with no form of analgesia. It was designed for primiparous women who underwent early obstetric analgesia using concentrate anesthetics that have affected, to a great extent, the motor power with its possible drawbacks on labor outcomes. Moreover, this study has used the epidural early in labor that solely can increase labor duration. To our knowledge, this is the first controlled trial conducted to evaluate the effect of dilute epidural analgesia on the duration of labor and maternal and neonatal outcome, compared with a group not receiving any sort of analgesia. The limitation of our study was the lack of double blind methodology. This is because it was impossible to blind the clinician or the parturient to the assigned group, however, we would not expect the results to present biased information as there was tremendous consistency with the obstetrical protocols. Other criticism which could be raised is the ethical conduct of labor without any sort of analgesia. However this was completely left to the patient desire without any sort of pressure to direct her selection, meanwhile she felt free to ask for analgesia at any time. In conclusion, epidural analgesia during labor using lidocaine (0.5%) with fentanyl is not associated with any prolongation of the first and second stages of labor compared with a control group not receiving analgesia. However, significant oxytocin augmentation is required in the epidural group to maintain this comparable labor duration. 1. Kuhnert BR, Linn PL, Kennard MJ, Kuhnert PM. Effects of low doses of meperidine on neonatal behavior. Anesth Analg 2002;64:335-42. 2. Sekhavat L, Behdad S. The effects of meperidine analgesia during labor on fetal heart rate. Int J Biomed Sci 2009;5:59-62. 3. Littleford J. Effects on the fetus and newborn of maternal analgesia and anesthesia: A review. Can J Anaesth 2004;51:586-609. 4. Milwidsky A, Finci-Yeheskel Z, Mayer M. Direct stimulation of urokinase, plasmin, and collagenase by meperidine: A possible mechanism for the ability of meperidine to enhance cervical effacement and dilation. Am J Perinatol 1993;10:130-4. 5. Yilmaz B, Kart C, Kelekci S, Gokturk U, Sut N, Tarlan N, et al. Meperidine versus valethamate bromide in shortening the duration of active labor. Int J Gynaecol Obstet 2009;107:126-9. 6. Mousa WF, Al-Metwalli RR, Mostafa MM. Epidural analgesia during labor-0.5% lidocaine with fentanyl vs 0.08% ropivacaine with fentanyl. Middle East J Anesthesiol 2010;20:521-7. 7. Howell CJ. Epidural versus non-epidural analgesia for pain relief in labour. Cochrane Database Syst Rev 2000;2: CD000331. 8. Anim-Somuah M, Smyth R, Howell C. Epidural versus non-epidural or no analgesia in labour. Cochrane Database Syst Rev 2005;4: CD00331. 9. Howell CJ, Dean T, Lucking L, Dziedzic K, Jones PW, Johanson RB. Randomised study of long term outcome after epidural versus non-epidural analgesia during labour. BMJ 2002;325:357. 10. Halpern SH, Leighton BL, Ohlsson A, Barrett JF, Rice A. Effect of epidural vs parenteral opioid analgesia on the progress of labor: A meta-analysis. JAMA 1998;280:2105-10. 11. Thorburn J, Moir DD. Extradural analgesia: The influence of volume and concentration of bupivacaine on the mode of delivery, analgesic efficacy, and motor block. Br J Anaesth 1981;53:933-9. 12. Nafisi S. Effects of epidural lidocaine analgesia on labor and delivery: A randomized, prospective, controlled trial. BMC Anesthesiol 2006;6:15. 13. Schnider SM, Abboud TK, Artal R, Henriksen EH, Stefani SJ, Levinson G. Maternal catecholamines decrease during labor after lumbar epidural anesthesia. Am J Obstet Gynecol 1983;147:13-5. 14. Kotaska AJ, Klein MC, Liston RM. 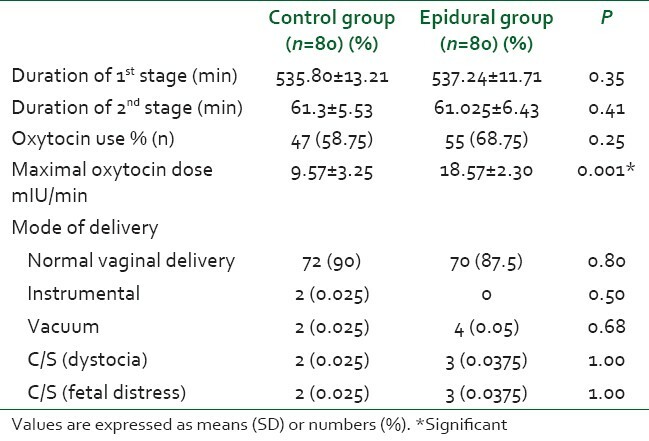 Epidural analgesia associated with low-dose oxytocin augmentation increases cesarean births: A critical look at the external validity of randomized trials. Am J Obstet Gynecol 2006;194:809-14. 15. Impey L, MacQuillan K, Robson M. Epidural analgesia need not increase operative delivery rates. Am J Obstet Gynecol 2000;182:358-63. 16. Thorp JA, Hu DH, Albin RM, McNitt J, Meyer BA, Cohen GR, et al. The effect of intrapartum epidural analgesia on nulliparous labor: A randomized, controlled, prospective trial. Am J Obstet Gynecol 1993;169:851-8. 17. Gambling DR, Sharma SK, Ramin SM, Lucas MJ, Leveno KJ, Wiley J, et al. A randomized study of combined spinal-epidural analgesia versus intravenous meperidine during labor: Impact on cesarean delivery rate. Anesthesiology 1998;89:1336-44. 18. Wong CA, Scavone BM, Peaceman AM, McCarthy RJ, Sullivan JT, Diaz NT, et al. The risk of cesarean delivery with neuraxial analgesia given early versus late in labor. N Engl J Med 2005;352:655-65. 19. Wang F, Shen X, Liu Y, Xu S, Guo X. Continuous infusion of butorphanol combined with intravenous morphine patient-controlled analgesia after total abdominal hysterectomy: A randomized, double-blind controlled trial. Eur J Anaesthesiol 2009;26:28-34. 20. Klein MC. Does epidural analgesia increase rate of cesarean section? Can Fam Physician 2006;52:419-21. 21. Liu E, Sia T. Rates of caesarean section and instrumental vaginal delivery in nulliparous women after low concentration epidural infusions or opiod analgesia: Systematic review. BMJ 2004;328:1410-2. 22. Muir HA, Shukla R, Liston R, Writer D. Randomized trial of labor analgesia: A pilot study to compare patient-controlled intravenous analgesia with patient-controlled epidural analgesia to determine if analgesic method affects delivery outcome. Can J Anaesth 1996;43: A60. 23. Turcot L, Marcoux S, Fraser WD. Multivariate analysis of risk factors for operative delivery in nulliparous women. Am J Obstet Gynecol 1997;176:395-402. 24. Effect of low-dose mobile versus traditional epidural techniques on mode of delivery: A randomised controlled trial. Lancet 2001;358:19-23. 25. Halpern SH, Stephen SM. Epidural analgesia for labor: Current techniques. Local and Regional Anesthesia 2010;3:143-53. 26. Morgan-Ortiz F, Quintero-Ledezma JC, Perez-Sotelo JA, Trapero-Morales M. Evolution and quality of care during labor and delivery in primiparous patients who underwent early obstetrical analgesia. Ginecol Obstet Mex 1999;67:522-6. 3 Does bupivacaine and fentanyl combination for epidural analgesia shorten the duration of labour? Antsaklis, A. and Vlachos, D. and Pergialiotis, V.
Pugliese, P.L. and Cinnella, G. and Raimondo, P. and De Capraris, A. and Salatto, P. and Sforza, D. and Menga, R. and DæAmbrosio, A. and Fede, R.N. and DæOnofrio, C. and Consoletti, L. and Malvasi, A. and Brizzi, A. and Dambrosio, M.